Lucky or not, my daughter inherited her curly hair from both her father and I. On bad days, I (internally) swear about her unruly curly hair and dream of days with hair that is straight, shiny and easy to comb. 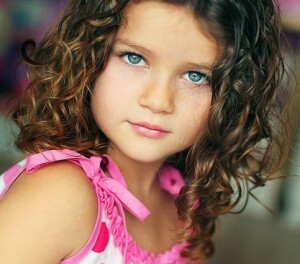 On the good days, I gush over her sweet curls that totally match her fun and charming personality. If you have a curly headed child, you can probably empathize with me. I’ve tried three different children’s detanglers and finally found one that is chemical-free AND works. My first go was with Noodle and Boo Conditioning Hair Polish. It worked okay as a detangler but was not heavy enough to hold any curl through out the day. When I found out that the parabens in it weren’t safe, I tossed it in the garbage. My second go around was with Kiss My Face Kid’s Detangler. Kiss My Face is a great line of natural body care products for both adults and children. While the detangler worked to loosen the knots in my daughter’s hair, it has a bold orange smell that lasts ALL day that I just couldn’t get over. It also left her hair fairly greasy with more than one day’s use. 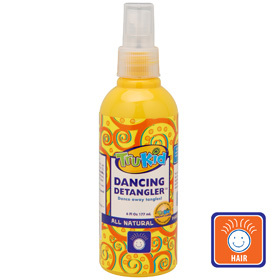 Finally, I picked up Tru Kid’s Dancing Detangler and TA-DA. Not only does it detangle but it adds just enough hold to curls to last the day without any greasy left over. I LOVE this product! Since then, I’ve used other Tru Kid products including their shampoo, conditioner and bubble bath and have been happy with their entire line. 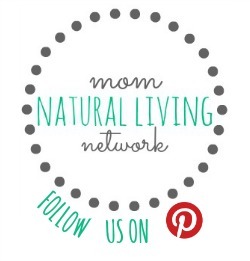 You can find Tru Kid products online or at your local natural foods store.